Born in Los Gatos, Robert Witmeyer is a multi-instrumentalist with deep ties to the Bay Area musical community. During his high school years, Robert played professionally at local venues and for corporations like Hewlett Packard. 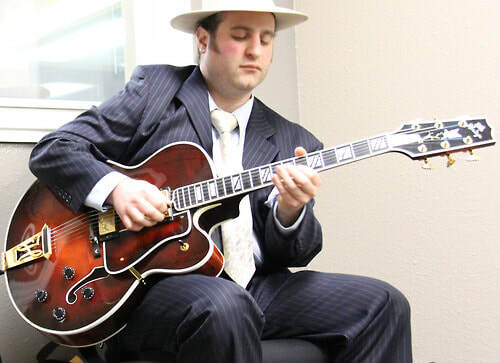 While studying Pre-Law and Poli Sci at UC Davis, Robert toured extensively with his Swing band, Martini Max and the Swing Kats. Before graduation, Robert released two critically-acclaimed albums containing original pieces he scored and arranged. After graduating with a BA from UC Davis, Robert ran local music stores and taught multiple subjects at various institutions like Charter Schools, Public Schools, Summer Schools, and even Prisons. Witmeyer has scored multiple films including Hark, which went to Cannes in 2013. He is now a contributing writer to Guitar Player Magazine. Likewise, Robert continues to release original music on iTunes and Amazon through his record label Blue Skool Records. He is more than comfortable teaching multiple instruments including: Guitar, Bass, and Piano, and loves all styles of music. Robert's teaching philosophy is to cater the subject matter to each individual student, ensuring that their passion for music is maintained.